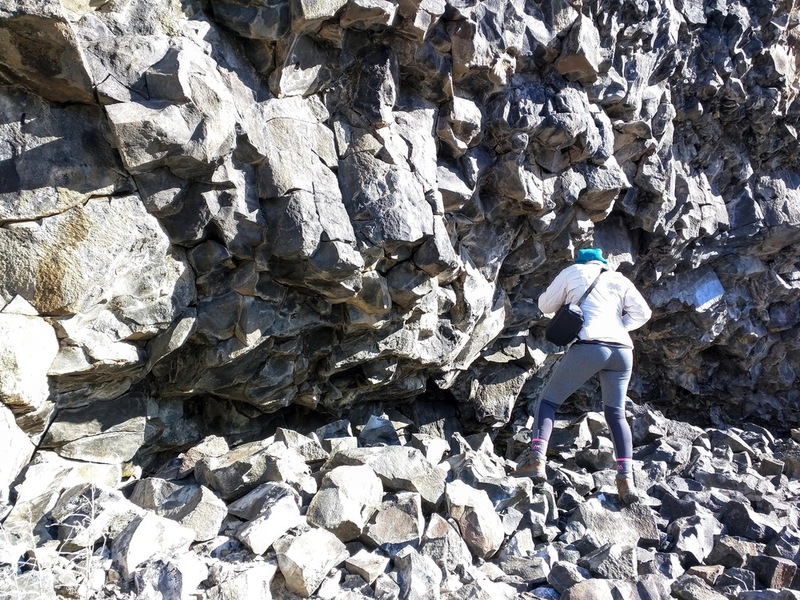 Created by the Missoula Floods during the last Ice Age some 15,000 and 13,000 years ago, this area is a geologists best friend. 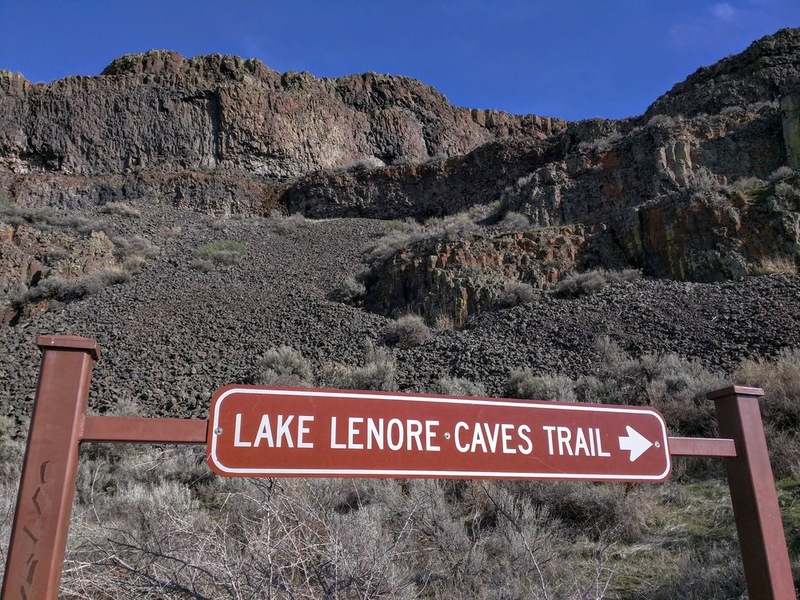 Ridges, plateaus, rivers, lakes, coulees, and caves are some of the sites to be seen and explored here. 5,000 years ago Native Americans used this area to collect plants, fish, and hunt. The caves were used as a temporary shelter by them and some of these areas are still considered sacred. Today it’s used for explorers and hikers like us. This is going to be a bit of a drive for most. The drive out there from the Tacoma area took us about 4 hours. Along the way we stopped a few times, including another stop at the Wild Horse Monument right after crossing the Columbia River. We discussed if we should split the trip into 2 days, and stay the night somewhere. We ultimately decided we’d make it back home later that night. It was a long day, but doable. After the long drive we were eager to get out and hit the trail. If needed, there’s a single restroom available at the parking lot. After we used it we proceeded to a historical information board explaining a little bit about the area and its use by Native Americans. We continued on to the trail. This first portion is short with a mix of dirt and rock turning to asphalt. Easy to hike. 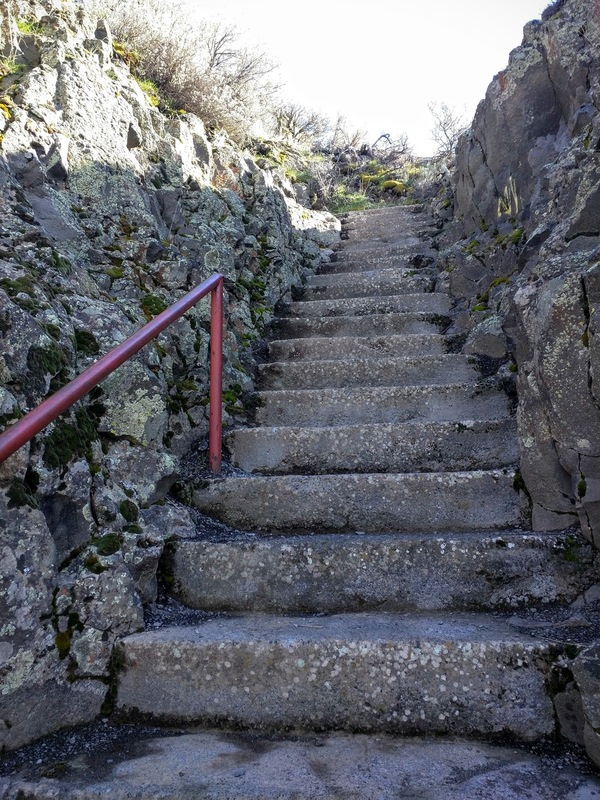 We came by a staircase with a handrail which was built through the middle of a large rock. Other trip reports indicated that these stairs were carved right out of this large rock. However, they looked like poured concrete to us. 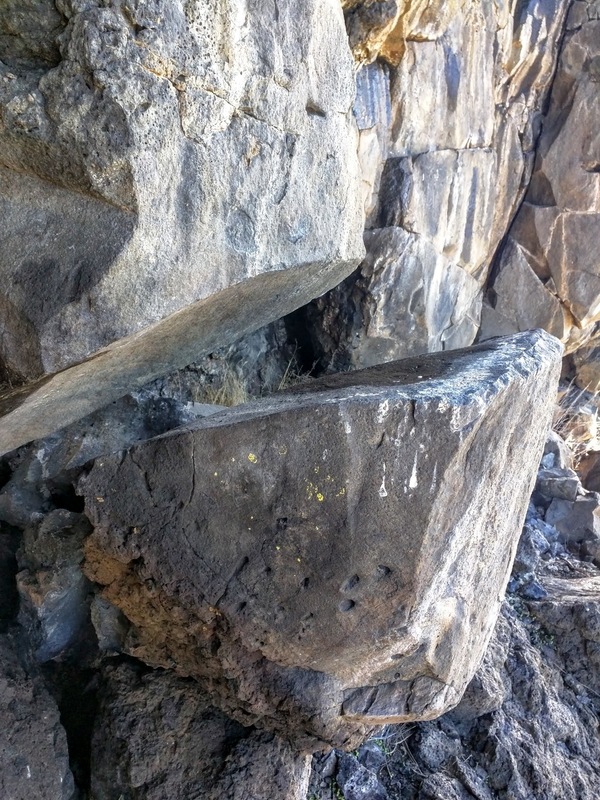 Surely, the rock itself was carved, or blasted out, but the actual stairs are almost certainly not part of the original structure. Either way, it was a nice little help to get over this steeper portion. Now that we reached the top of the staircase we had the option of going left or right. There are caves either way you go. We chose right since we read that the larger caves are that way. Before proceeding we took a moment to look back towards Lake Lenore and the enormous cliffs to the north of it. 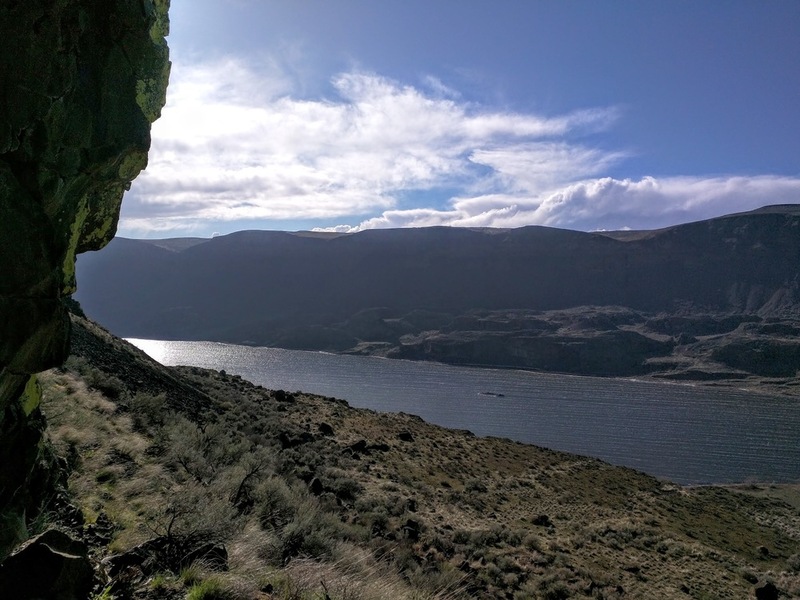 It’s a spectacular view and really makes you think about the amount of water that would rush through here during the Missoula Floods in order to form this area. We continued on and reached our first cave shortly afterwards. All of the caves here however are not the types of caves that come to mind for most people. 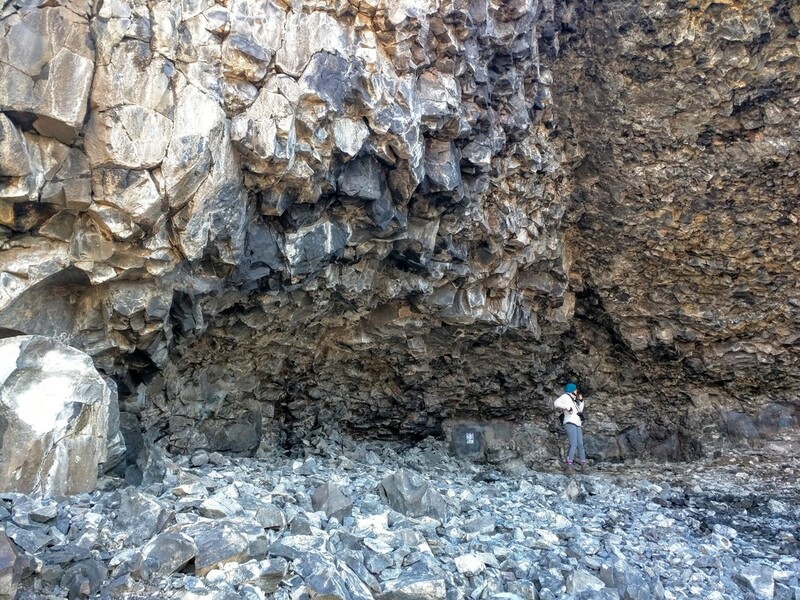 These are all large openings in cliff faces, none of them descend deeper underground. 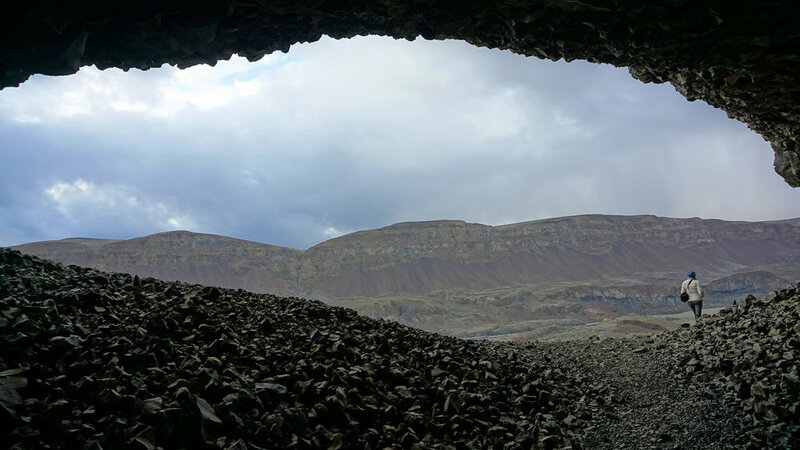 As a matter of fact, they’re technically called rock shelters which are referred to as “shallow cave-like openings”. Nevertheless, they’re still amazing to explore. As we entered the first one the first thing we noticed was all the fallen pieces below our feet. 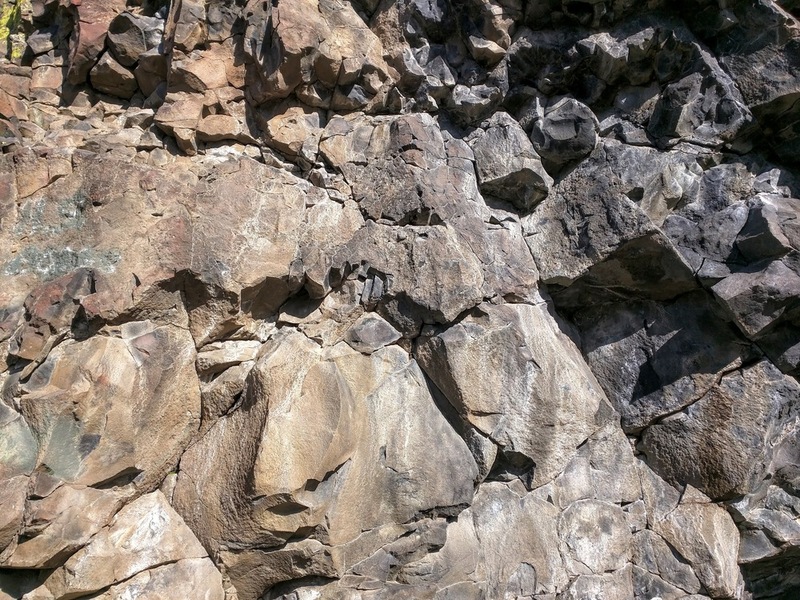 Thousands of broken off, sharp-edged rocks line the floors and have slid out towards the slopes below. These all range in size from small handheld pieces to larger boulder-like pieces. The rocky ground is loose everywhere you step here. After this first cave we continued on the trail. Here, the trail becomes multiple trails, leading in all directions, making it hard to tell which way we’re supposed to go. We saw one that headed up and that’s the way we went. It turned out that this was not the way to the rest of the major caves, but we still found more to explore. Once we climbed upwards a bit we were now on a level plateau directly above the caves we should have been exploring. This entire area is mixed with these “levels”. Some of them merge with others so it’s hard to tell the exact number of them, but we would say 4-6 main levels exist here. These plateau areas are covered in sage and low growing bushes, spongy moss, grasses and newly emerging wildflowers. Nutrient poor, wind battered meadows of a sort. While water carved out this region, wind is now the primary sculptor. The twisted, contorted branches of the brush is clearly evident. After walking for awhile we wondered if we were in the right location. Looking up, we noticed another opening towards the top of a steep slope. We decided to scramble up it. This was slippery due to the loose rock. There was no trail and we used our best judgment for our route up. Upon reaching the opening, this was similar to the first cave but not as big. The views from up here were pretty good though. We headed back down. Wondering which way to go we noticed a group of people out in the distance, further away from where we should have been going. We headed toward them. We asked if there were any more caves out this way and the answer was no, they were all back in the direction we came from. 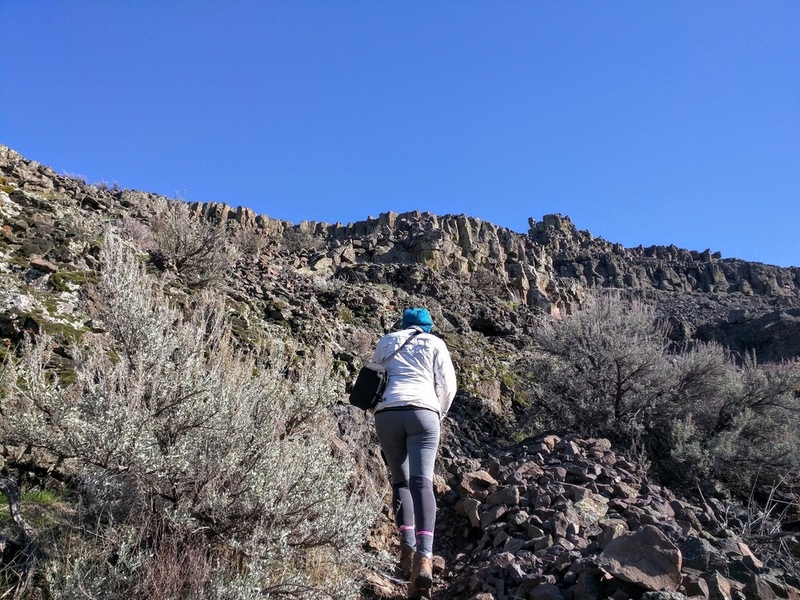 But, one member of their group did climb to the top of the ridge and indicated there was a view of another coulee on the other side. They pointed out the area climbed and we decided to check it out for ourselves. The climb up was similar to the last one we just did. Slippery and almost as steep. It didn’t take long though before we reached the top. We were now on a lower saddle-like section of the uppermost ridge in the area. The views from here were excellent! On the other side of the ridge was a large open area with multiple small lakes. Looking in both directions of the top of this ridge made us want to walk the entire thing. We didn’t have time though. We took some video and photos, we also tested out a new tool of ours, the XShot Sport Extender Pole. This came in great for getting video footage hanging over the cliff edge. Dark clouds were rolling in and it was very windy up here. Time to get going. On the way back we found an easy area where we could drop down another level. We assumed that the rest of the caves would be below us so that’s where we headed. Good call. We came by a punch bowl like opening and within the walls of it was one of these caves. This was much larger than the previous ones. After leaving this we found ourselves back on a trail again. A short distance later was a twin-like set of caves. Like the last one, there was a large opening in each of these. On the way out we found ourselves passing by that very first cave. From there we made it to the staircase and back down to the parking lot. This is a fascinating area for the curious. We could have easily spent another whole day poking around, exploring and admiring the views. Intriguing rock formations, sharp scents of sage, howling winds, and abundant bird life are all a part of this experience. The contrast of the landscape in comparison to western Washington is truly compelling and pulls you onward. 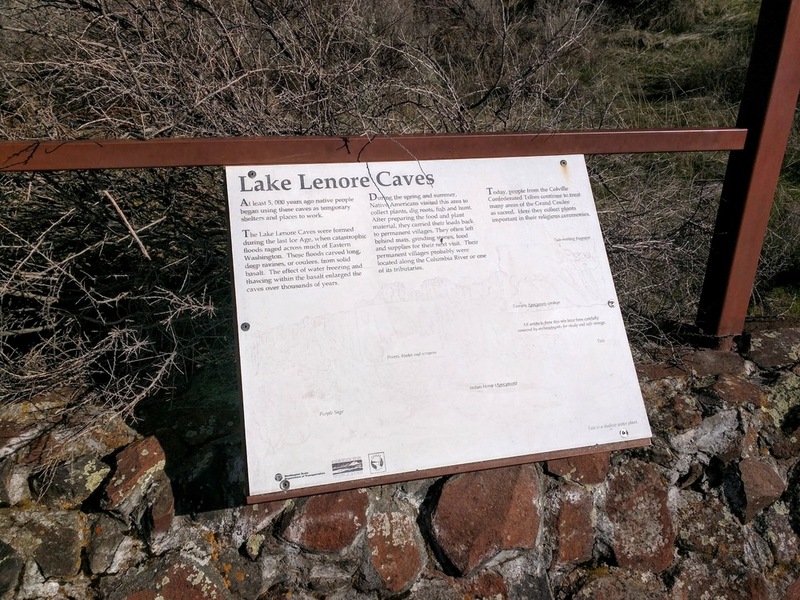 When we head back out to the area again, probably on our visit to Sun Lakes-Dry Falls State Park, we’ll check out the caves to the left of the stairs.